After much success here in Canada,Jonas & The Massive Attraction are set to release their album “Big Slice” in Europe on February 10, 2012 through Big Slice Records/H’ART Musik. The band has just announced the European leg of their “Big Slice Tour 2012” that will start in Copenhagen, Denmark on February 25th at Beta and will see the band perform throughout Germany, Austria, Switzerland and the Benelux in March to support the release. 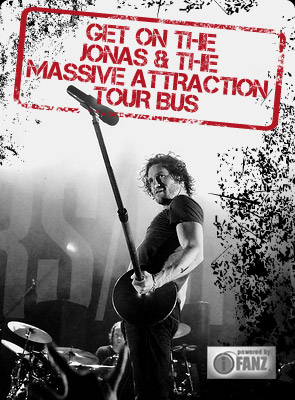 As part of the tour, Jonas & The Massive Attraction will perform a very special show at Harmonie in Bonn, Germany on March 21, 2012 with The Soundtrack Of Our Lives. The live performance will be taped for the renowned German television show Rockpalast, who have recorded such international stars as Coldplay, Guns ‘N Roses, The Killers, Kings Of Leon and Metallica to name a few. The performance will be broadcast nationally later in the year on WDR TV as part of their program Crossroads. The band will release a special remix of “Seize The Day” to mainstream radio in Germany and Austria as their first single in January.